I’ve had a very busy week since my last Fridaygram, I had my beautiful friend Julie’s wedding last weekend, I had a crazy week in work, and I started swatching and taking pictures of new products I want to try. 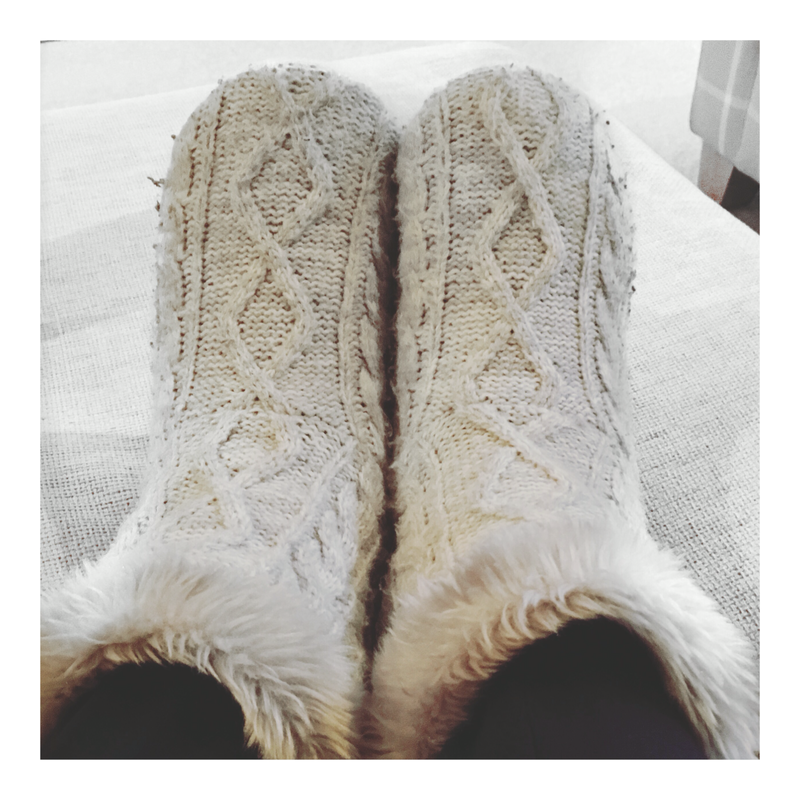 After getting my nails and spray tan done in prep for the wedding on Saturday, I had a cosy Friday night in with my slippers and a movie. I needed to make sure I got my beauty sleep for the fun ahead on Saturday! 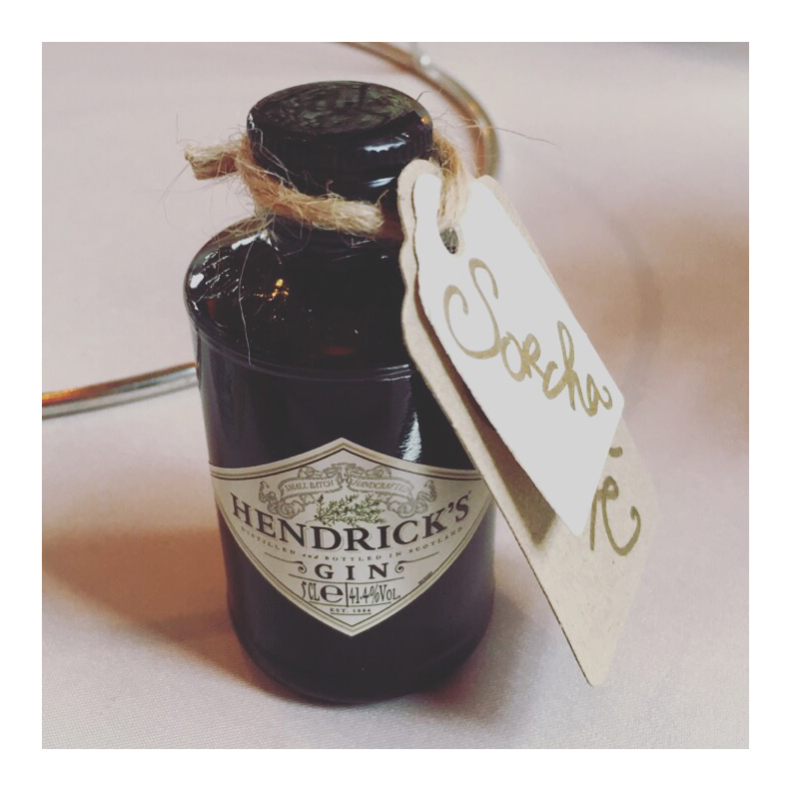 My friend Julie is a big fan of Hendrick’s Gin and Tonics, so when I saw our places names at the wedding were miniature bottles of Hendrick’s, I just had to share. Have you ever seen anything so cute?! I also shared this picture of me and one of my good friends Pam who I hadn’t seen since my own wedding back in December. Julie is all about the details so on Sunday I just had to share some more wedding photos. 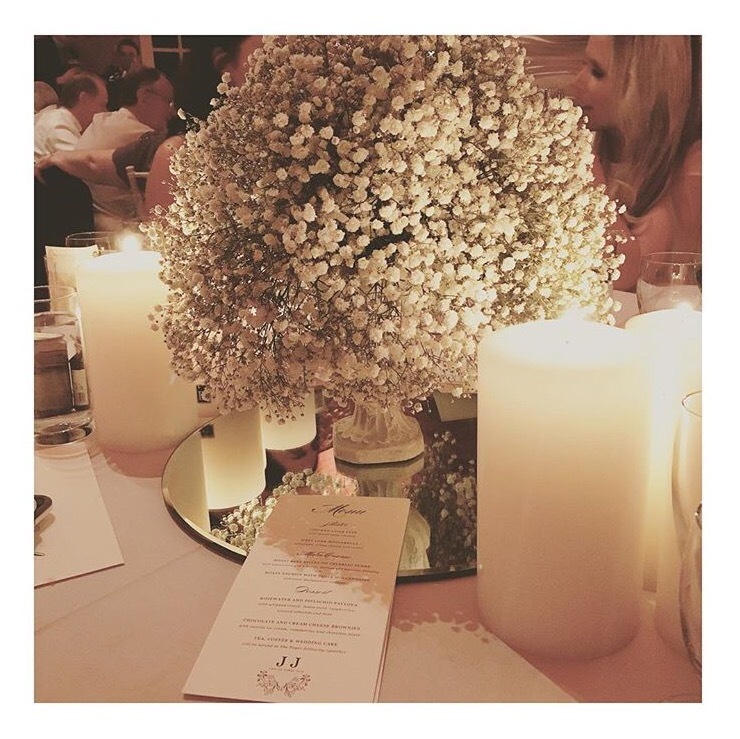 These Baby’s Breath centrepieces were just stunning and gave the tables such a romantic vibe. Always one for positivity, I shred this Monday Motivation picture. 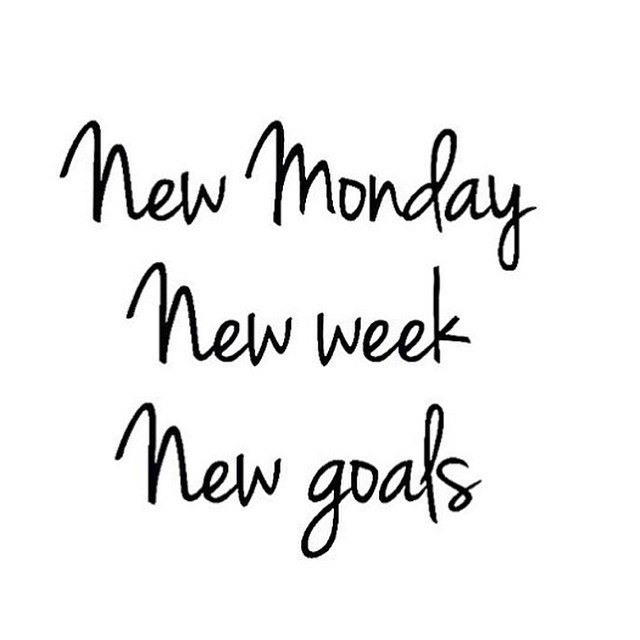 There’s no better way to start the week than putting yourself in the right frame of mind (even if it does all fall away after a day or two!). In case you missed it, on Tuesday I blogged all about our trip to Paris and what the highlights of the trip were for me. This picture was taken of Dave and I on the River Seine and is my favourite picture of our weekend away. I love the Eiffel Tower peeking in the background! I also shared this picture I came across on Pinterest which I just love. As mentioned above and in many of my blog posts, I love inspirational quotes and images, and this one is just brilliant. 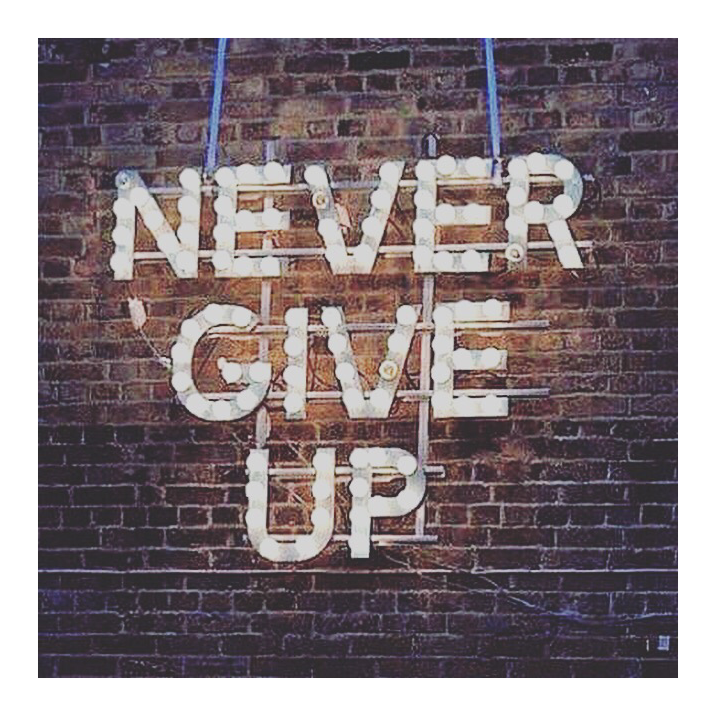 Sometimes when you’re having a bad day you think about packing it all in, but as the saying goes, we should never give up! 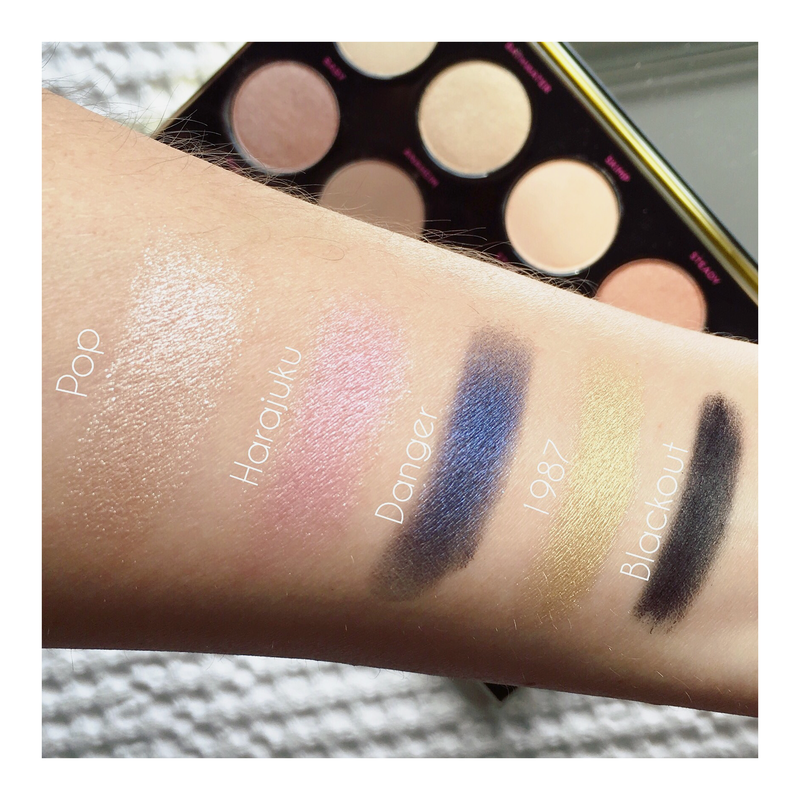 I have been obsessed with the Urban Decay Gwen Stefani eyeshadow palette for the last while as many of you might have guessed by now! So on Wednesday I posted this shot of my favourite swatches from the palette. I also shared this picture of my new sunglasses. 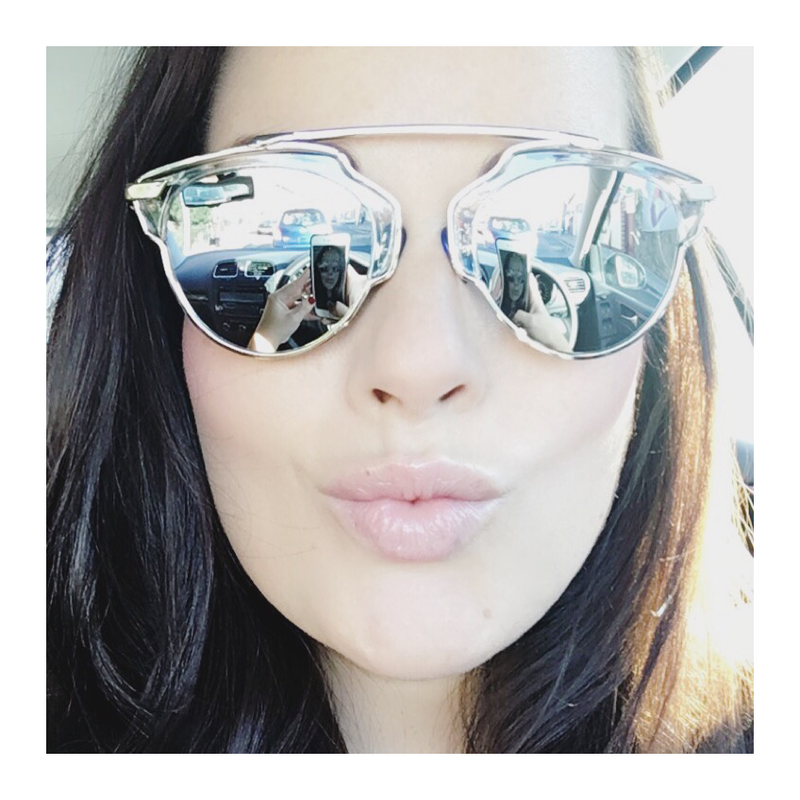 I’ve been coveting round style shades for a while now, so when I came across these little babies from Custom Vintage Dublin last week, I just had to order them. Perfectly on trend for this summer! I recently got sent some products from the lovely people over at Catrice cosmetics so I’ve been trying them out over the past few weeks. 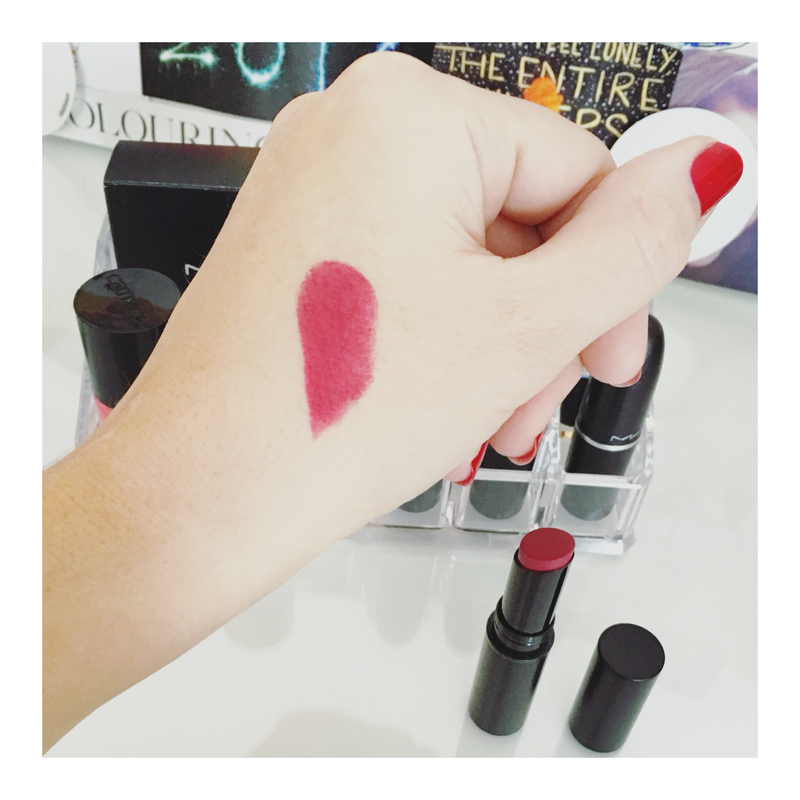 This lipstick from their Ultimate Stay range in shade ‘Don’t Worry Be Berry’ is just gorgeous, it’s my current favourite shade and I’m really impressed with it. 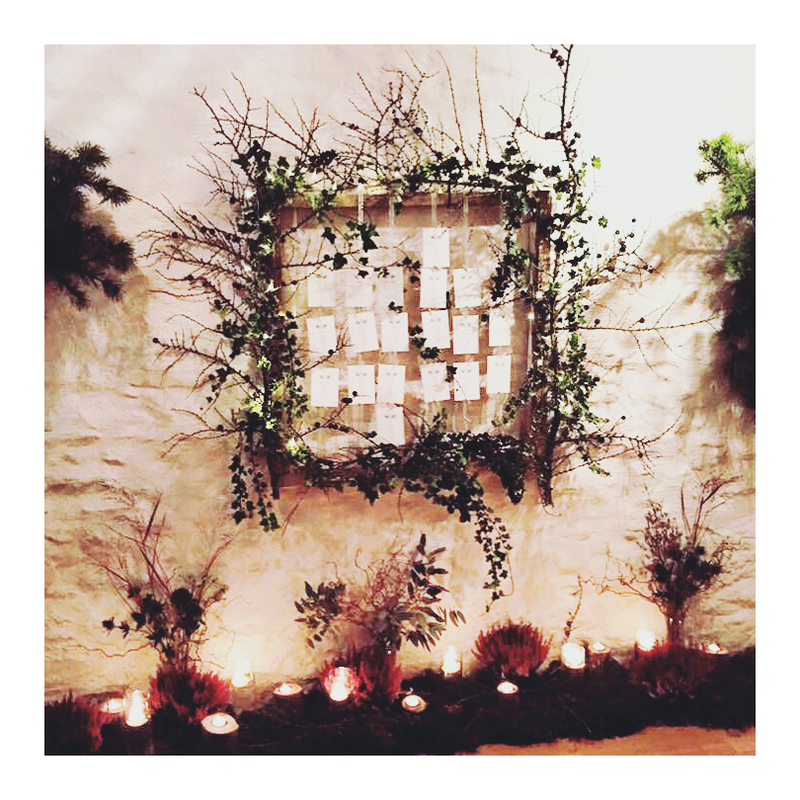 I also shared this Throwback Thursday post from my wedding of our table plan. My theme was an outside, inside candlelit forest kind of theme and I just love this picture. We just got our wedding video a few days ago so I’ve been watching it on repeat and it’s bringing back such incredible memories. I just want to do it all again! 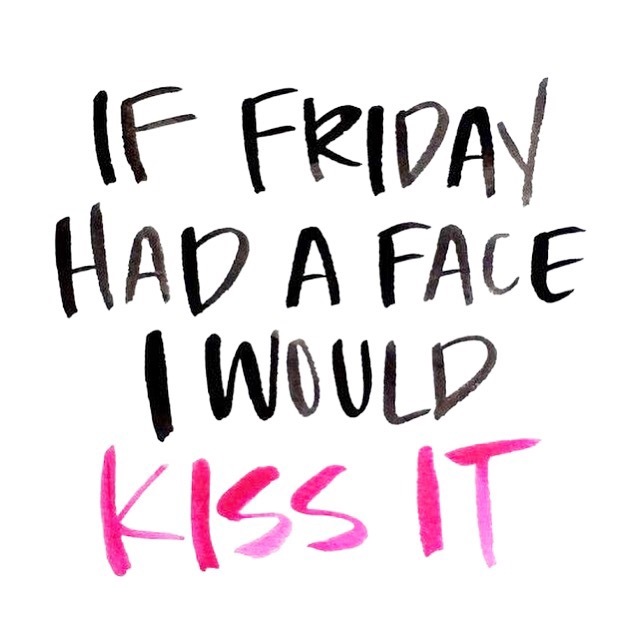 I love Fridays as we all do, and a Friday meme always puts me in a happy mood. This one I came across last night made me smile. 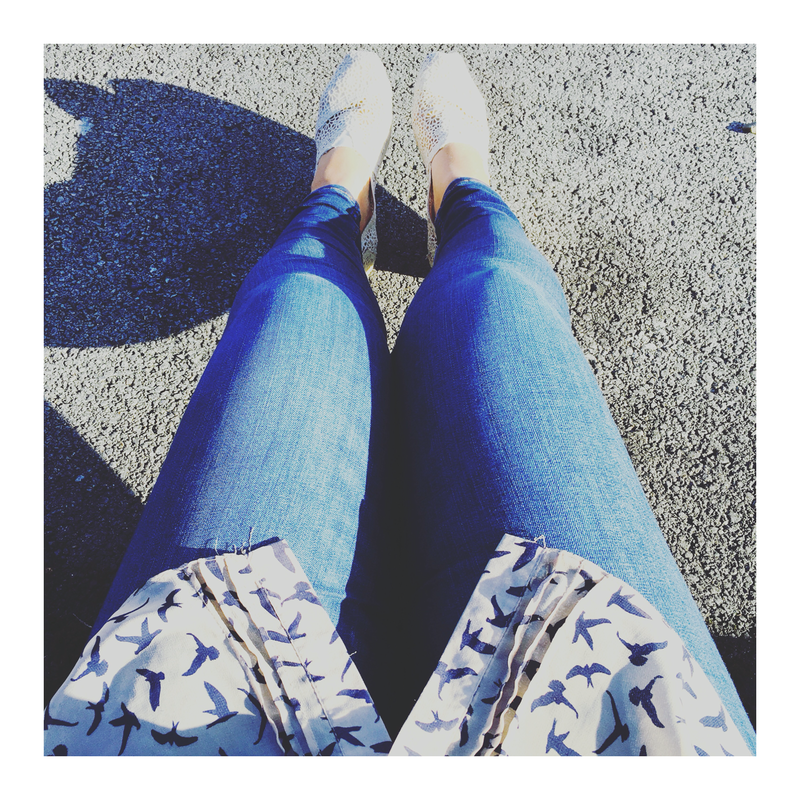 I also love casual Fridays, and as the sun is finally starting to show its face, I can start to wear flowy blouses and summer shoes again, yay! So there you go. I don’t know where the weeks are going at the moment, but each week that passes is a week closer to summer, which let’s face it…rocks! As always, if you’re not following me on Instagram please come say hi here. I’ve had one of those weeks this week, we all have them, and while we’re going through them we can’t seem to escape them. While I’ve been contemplating all that’s going on in my life, what I’ve realised is that it’s okay to have a bad week. It’s okay to cry, it’s okay to be stressed, it’s okay to rant, and when it’s all over, it’s okay to reflect and move on. 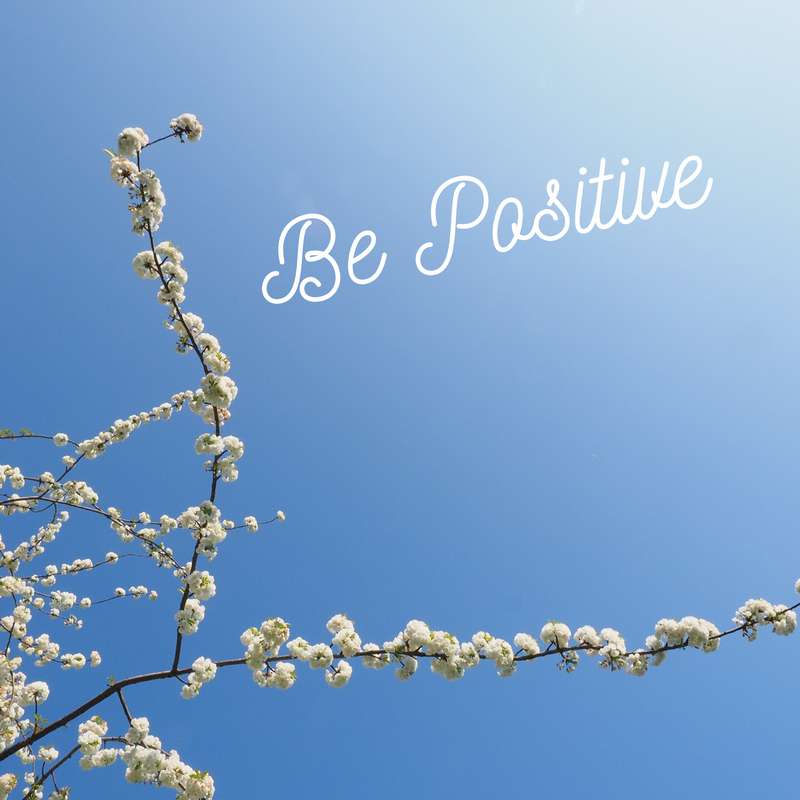 So I’ve decided to channel all my inner positivity today in the hopes of starting this day off on a better note, and prevent another day of dropping my food on the floor, spilling my tea, getting stressed and welling up for no reason. So on that note, I wish you all a happy, positive Thursday. Let’s all be safe in the knowledge that there’s only one day left until the weekend! 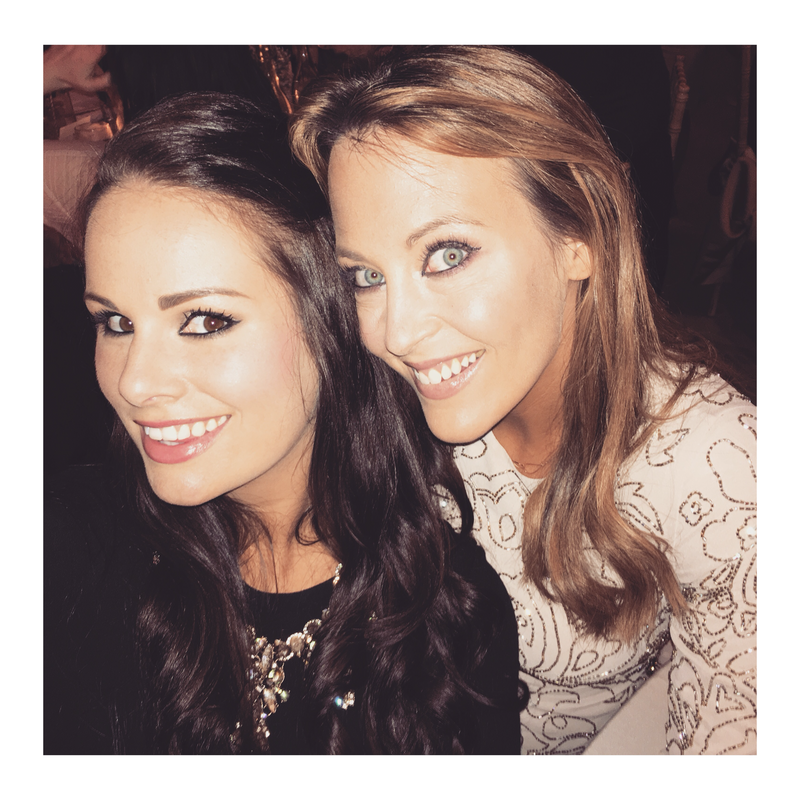 I’ve got my friend Lucy’s hen this weekend so another very fun, exciting weekend ahead and I can’t wait. 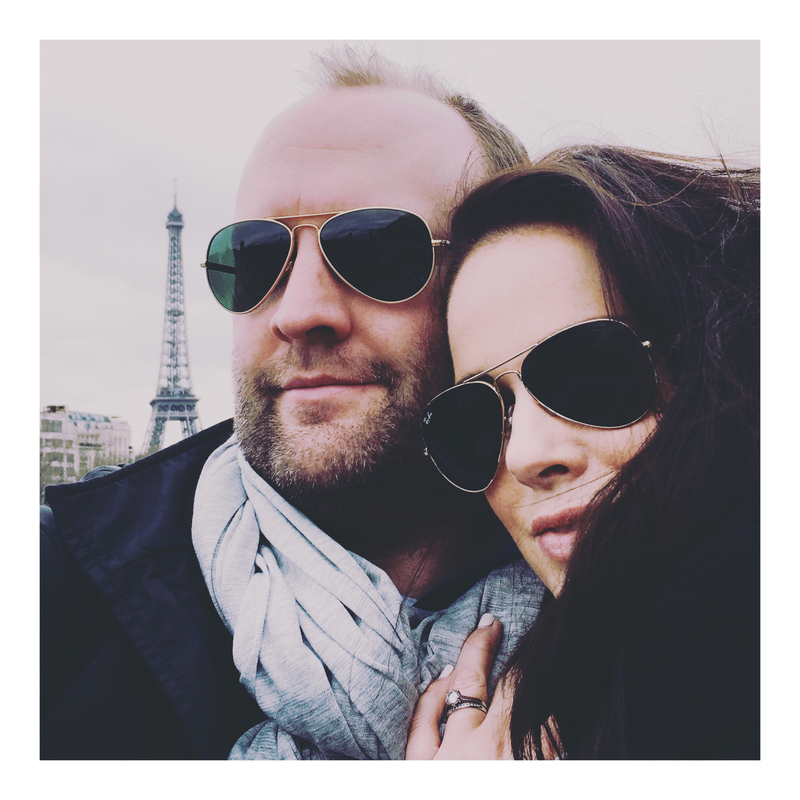 If you’ve been following my blog for a while now, you’ll know that over the Easter weekend Dave and I headed to Paris for a city break. I hadn’t been to Paris in a very long time, we had never been together and for as long as we have been together, we’ve been planning on going. So needless to say, I was super excited about our trip. There’s just something about the air in Paris, isn’t there? If you’ve been before you’ll know exactly what I mean. It just screams chic. The style, the architecture, the fashion, the attitude, the personality, the atmosphere. The effortlessness of it all is intoxicating and you find yourself wondering what your life would be like if you were born a Parisian. We arrived late on Thursday evening so it was straight to bed for a good nights sleep, I had a lot planned so wanted to make sure we were both up to getting everything done. Our hotel was a small boutique hotel, and while it was fine, the location wasn’t really what we’d hoped for. We were staying in what we thought was Le Marais, but actually it was further out. So thank god for the Metro! We did so much so I’m not going to go into everything, but rather share what the highlights of the trip were for me. 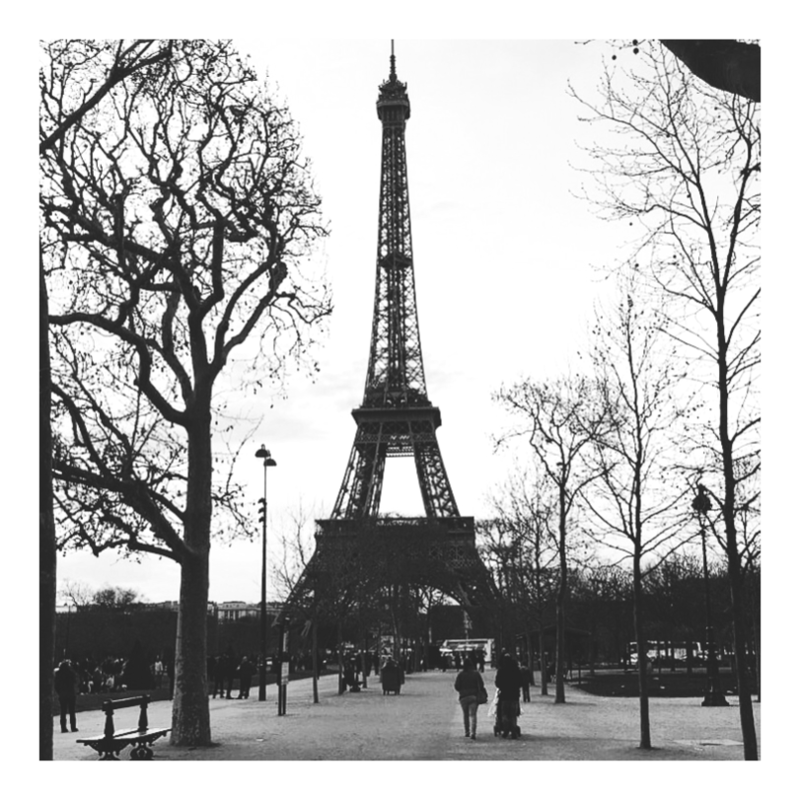 And hopefully, if you’re off to Paris anytime soon, it will give you some tips on where to go and what to do! Our first stop was the Moulin Rouge and Montmartre. 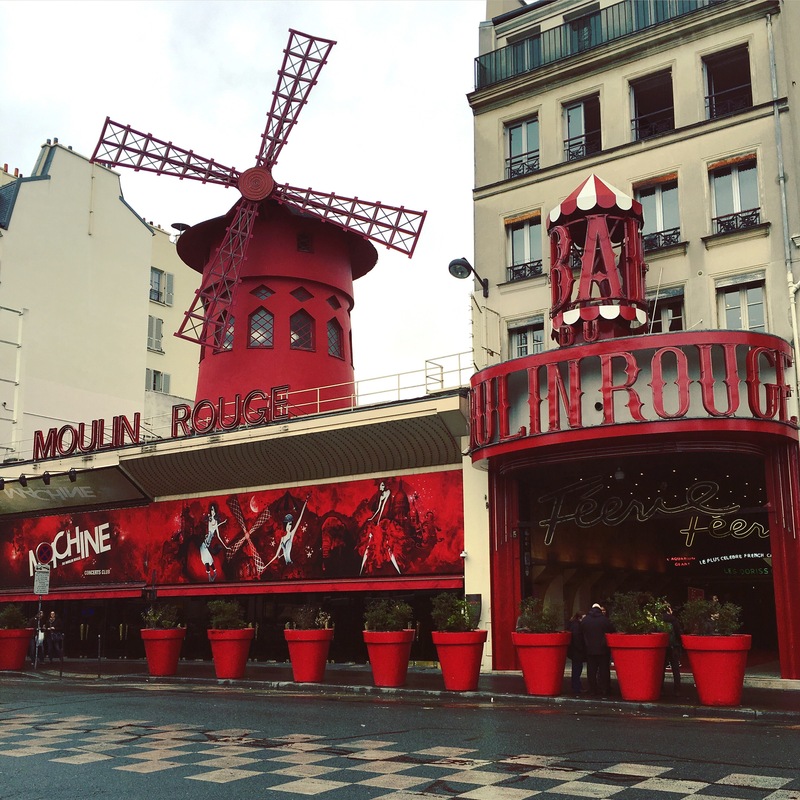 I have always wanted to see the Moulin Rouge, as cheesy as it might be, I’m kind of fascinated with that period of Paris in the early 1900s; the champagne parties of the rich and famous, the artists, painters and writers who hung out there for inspiration, and the artistic movement in general around that time. It seems like it was a great time to live. So it was great to see it in person and for a moment imagine what life would have been like back then. 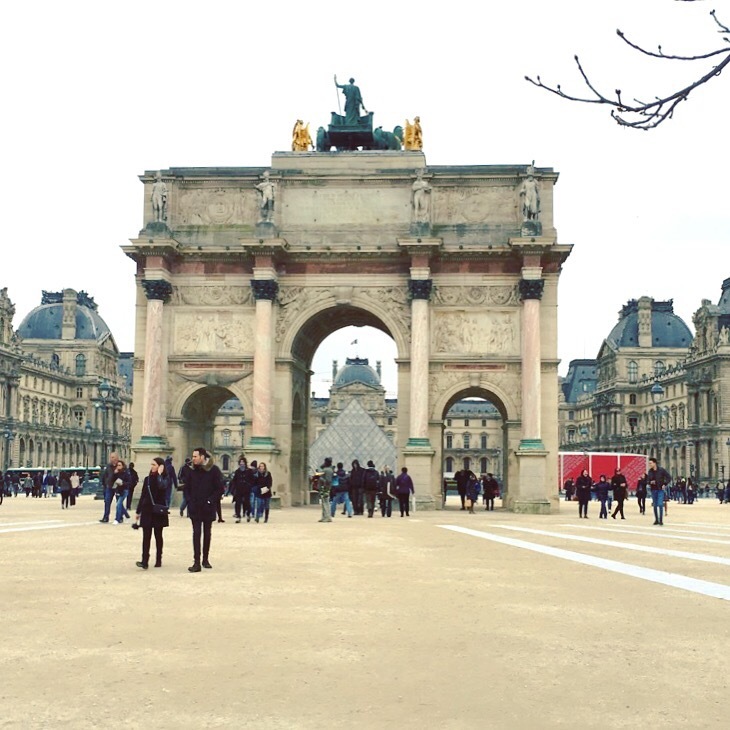 An obvious Tourist attraction, the Louvre is as much a monument as a museum. 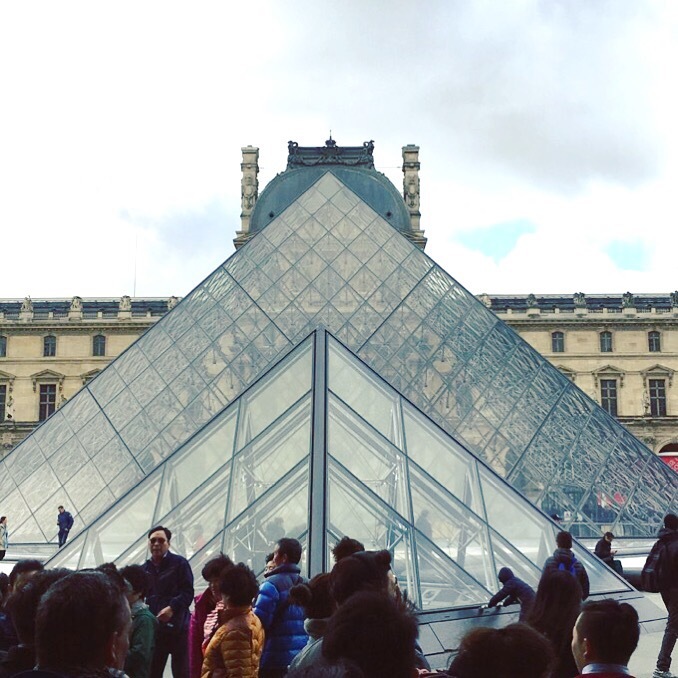 The infamous glass pyramid is the first thing that greets you as you arrive at the Louvre Palace, and alone is worth a visit. It’s quite a spectacular site to see and the setting of the Palace grounds that it sits in, are just stunning. Unfortunately unless you arrive very early however, it’s hard to take it all in with the thousands of tourists that gather there each day, but you can still appreciate the grandeur of the buildings and architecture. 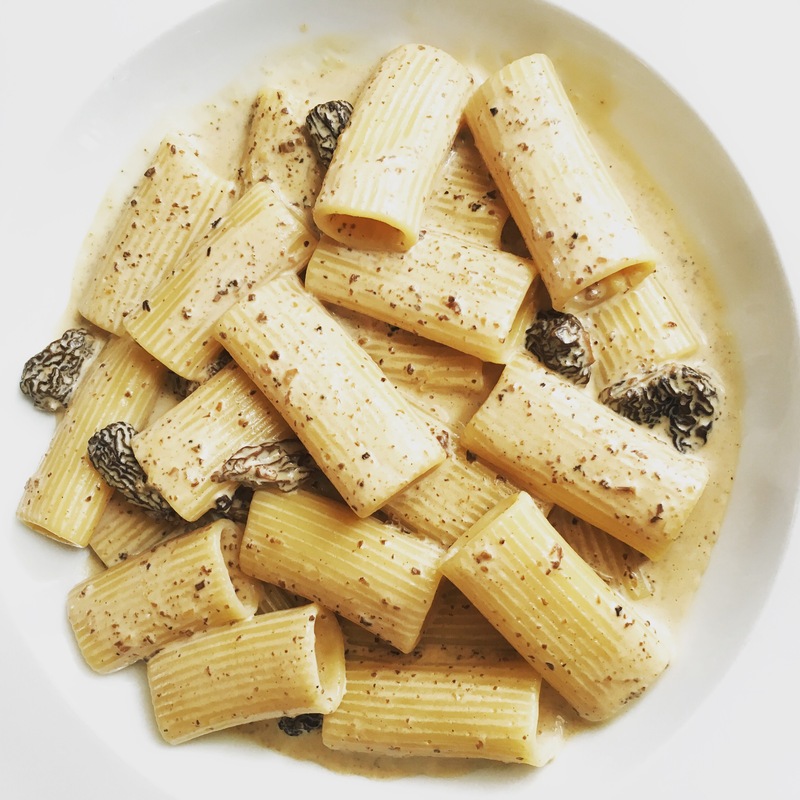 You could easily spend an entire day wandering the halls and exhibits of the Louvre, but as we were pressed for time, we made our way straight to the Italian and Greek artists. As with most people who visit the Louvre, the Mona Lisa was the top of my list and it was amazing to see it in real life. Smaller than I imagined it to be, but amazing. Next on my list was the Venus Di Milo statue, which again was incredible. So much of art history is housed in the Louvre, and while I’m certainly no art connoisseur, we really enjoyed the few hours that we spent here. Initially Pont Neuf was not on my plan for the trip, but for as long as I can remember, I wanted to go to the Love Lock Bridge in Paris. 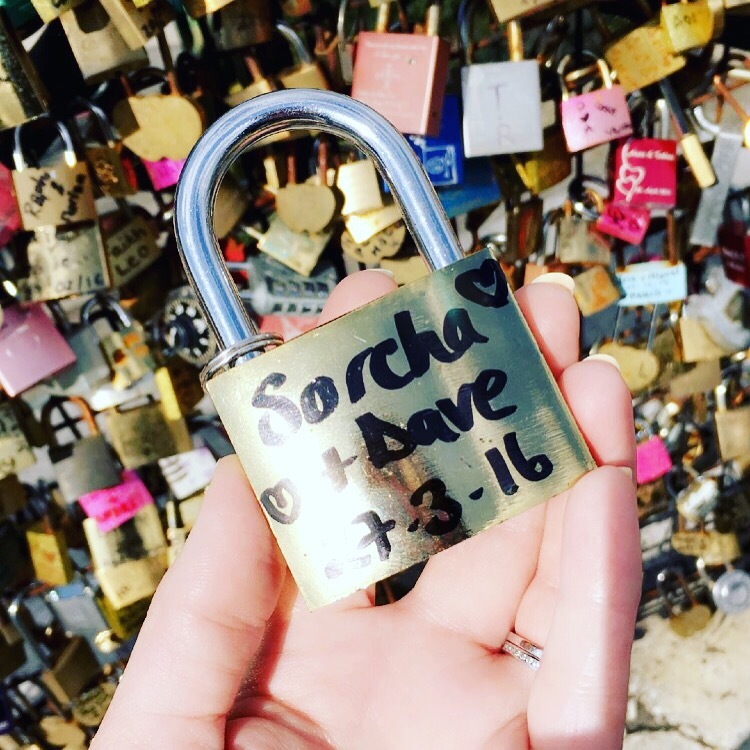 Traditionally this was the Pont des Arts, but in 2015, the French authorities had to remove all the love locks from the Ponts des Arts due to the weight of the locks damaging the infrastructure of the bridge. Although I had read about this last year, I didn’t realise all the locks were gone so when we arrived to nothing but empty railings, I was so disappointed. That was until, I discovered that a new place had been designated to the Love Locks, the Pont Neuf. 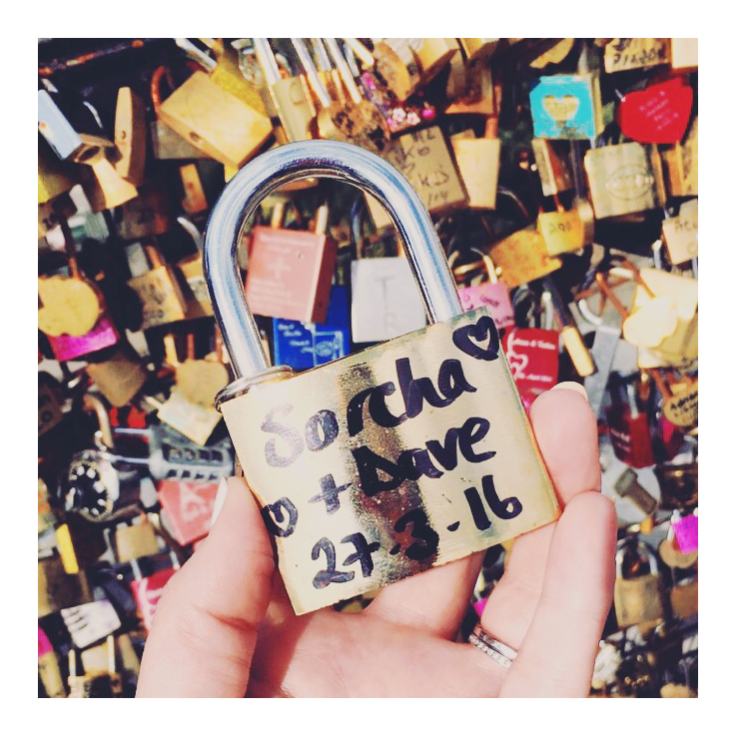 Once I discovered this, we made our way to the Pont Neuf, lock in hand (because I am that cheesy), and added our lock to the thousands of others that reside there. Then we sat in the sun overlooking the water taking it all in. 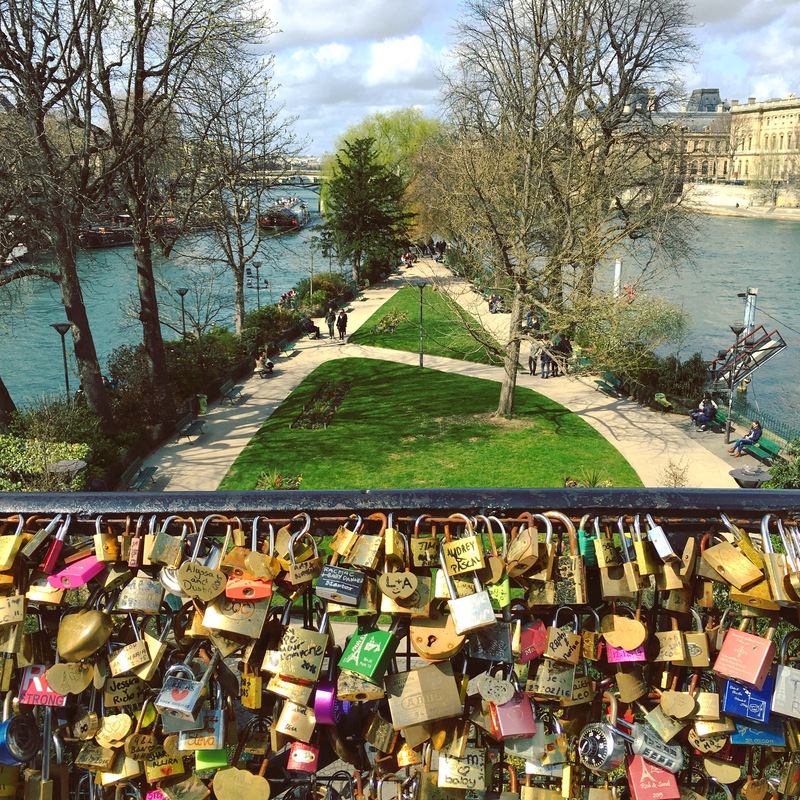 Even if you’re not a hopeless romantic, this is still worth a visit, even just to see the thousands of locks and messages that people have left there. Not to mention the stunning views it has of the city. You can’t help but be overcome with warm fuzzy feelings there, I even asked Dave to propose to me again, just because it was so romantic. As you can imagine, he was having none of it! Although there was no second proposal, I loved it all the same. Friends who travel to Paris a lot told me that Le Marais was the place to be, hence why we booked our hotel there (well what we thought was there). It is a historic district full of gorgeous boutiques, gourmet cafes, fashion houses and hip galleries and therefore a must for any trip to Paris. I could have spent hours (and a lot of money) wandering through the small streets shopping, eating and drinking – the fact that the weather was glorious for our visit was an added bonus too. We went for lunch, strolled around the shops then found ourselves a lovely cafe where we sat drinking wine watching the world go by. The perfect way to while away an afternoon in the city of love. There’s really not much to say about the Eiffel Tower as it speaks for itself. As you would imagine, it is a haven for tourists so this place is busy all the time. I read somewhere that it’s the most visited, paid monument in the world with over 20,000 visitors a day. So that might give you an idea of just how busy it is. Because of this, we didn’t spend too much time here, but we did stroll around the Champ de Mars for a while taking it all in. You cannot come to Paris and not visit the Eiffel Tower, that infamous picture so many of us have in our minds of this city is the Eiffel Tower. But if you plan on going up the tower then be prepared for a long wait and lots of queuing. L’Avenue is a restaurant located near the upscale area of Avenue George V, off the Champs Elysees and so many people recommended us going here. Over the years I’ve read loads about it, so it’s been on my wish list for a long time and finally I got here! The restaurant is a combination of luxury interiors, tasty food and lots of hip and trendy Parisians, and is one of the places to be seen in Paris. 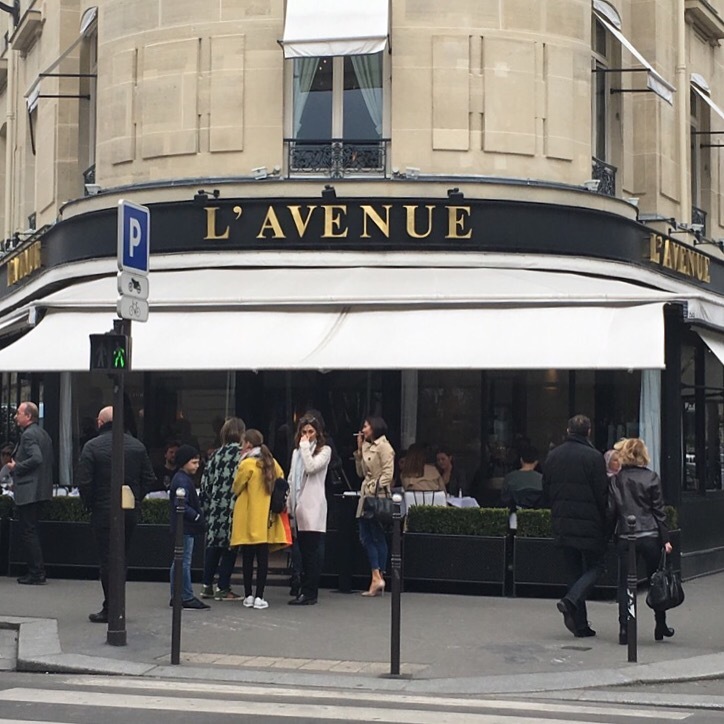 We booked in advance for lunch as it’s always super busy and spent the morning strolling along the streets taking in all the fabulous stores such as Chanel, Dior and Diane von Furstenberg. After a little shopping we arrived for lunch and we were not disappointed. Champagne flowing, I ordered a Prawn Risotto and Dave went for a Mushroom Rigatoni, and they were delicious. I ate so slowly, savouring every bite it was that good. This was then followed by dessert which for me was a Lemon Sorbet with a Pecan Tuile, and a Tarte Tatin for Dave. Again delicious. The restaurant isn’t cheap so be prepared to pay if you decide to go here. 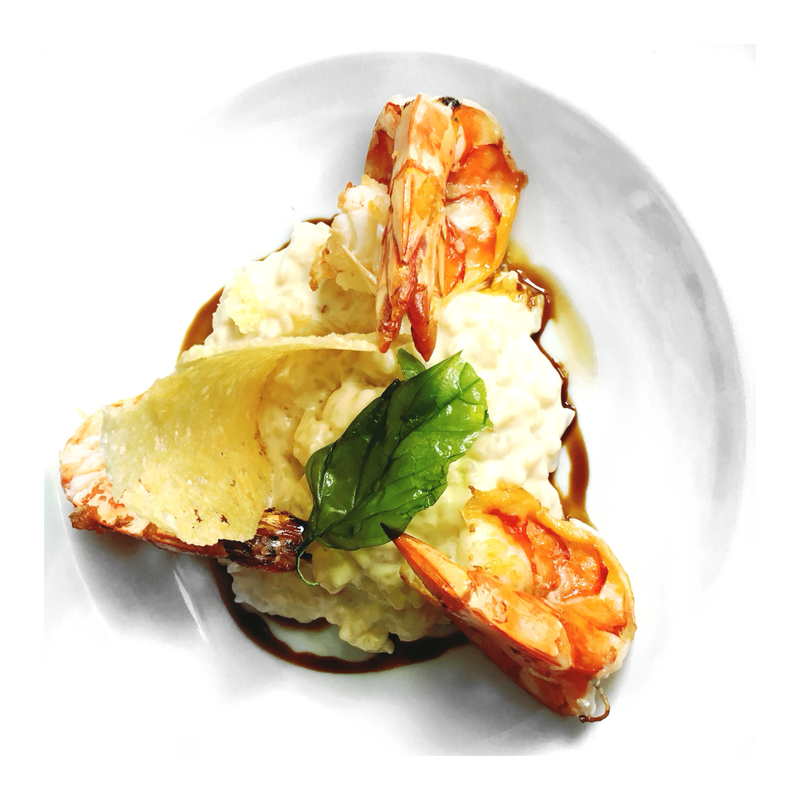 But for the food and the experience, it’s definitely worth it in my view. We had a lovely long lunch, and it made for the perfect afternoon. I’ll definitely be going back, especially as I discovered they do the skinniest fries I’ve ever seen, and skinny fries are my fav. I will need to have these in my life at some point! 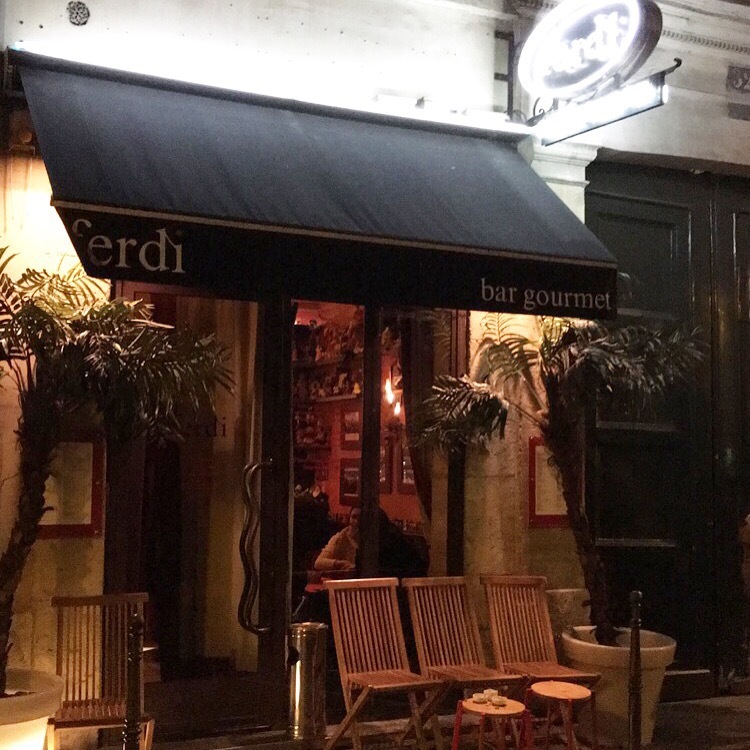 Again after several recommendations and lots of hype, we paid a visit to Ferdi one night for dinner. It’s not what you might expect from a Paris restaurant given that it’s actually a burger joint but my god is it the best burger I’ve ever had. This restaurant is hidden away on a small quiet street in the Opera district, and unless you know about it, you’d probably never venture in. The décor is red, like a lot of Parisian eating spots, but the interior is super fun and quirky with teddy’s, dolls and miniature cars dotted around the place. It’s small but cosy, with a great, relaxed atmosphere and the cocktails are delicious. 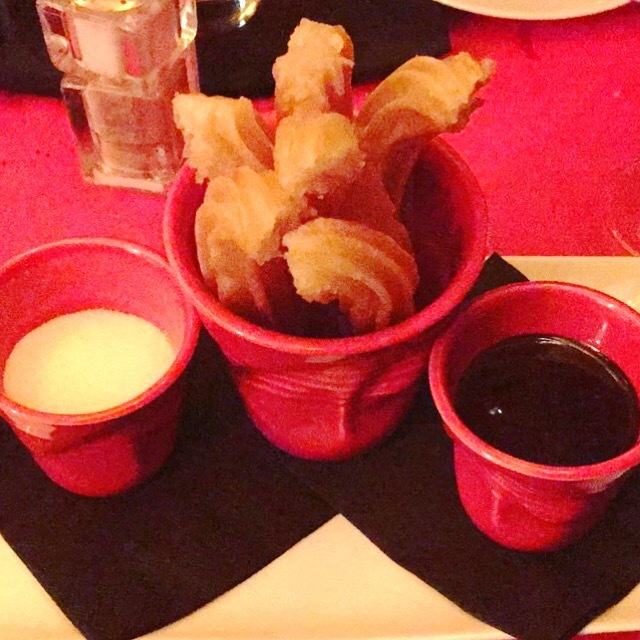 Given that it’s famous for its Cheeseburger and Churros, that’s what we ordered and we literally could have eaten it all over again afterwards. 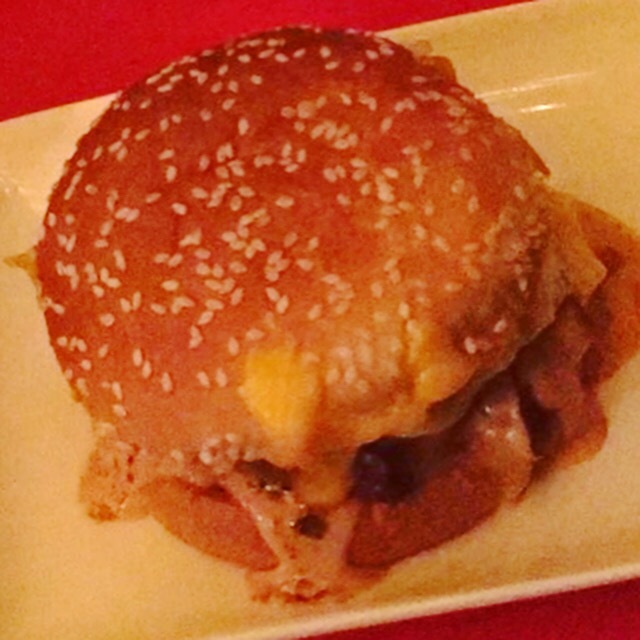 Not because we weren’t full, but because it was literally the best burger we ever had. So boldly delicious! 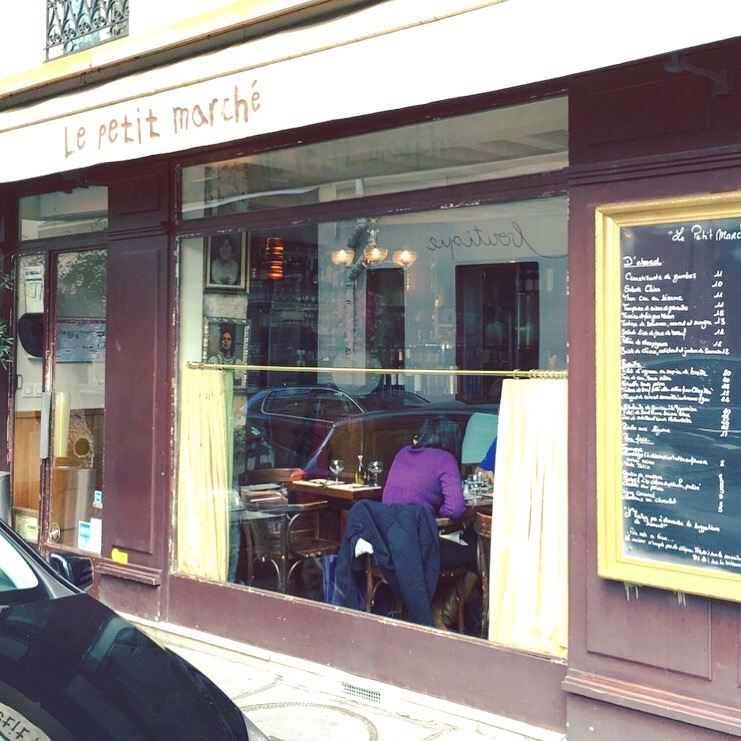 Le Petit Marché is a little French bistro situated in Le Marais and I had heard loads about it so we added this to our list of restaurants and asked our hotel to book us a table. It’s small, it’s rustic and absolutely buzzing and we were excited when we arrived. We both decided on Steak with pepper sauce, it was a little difficult to figure out the entire menu as neither of us speak French very well. As with a lot of Parisian restaurants, the staff did not speak English and there were no English menus. So if you decide to go here make sure you bring your dictionary si vous ne pouvez pas parler Français. 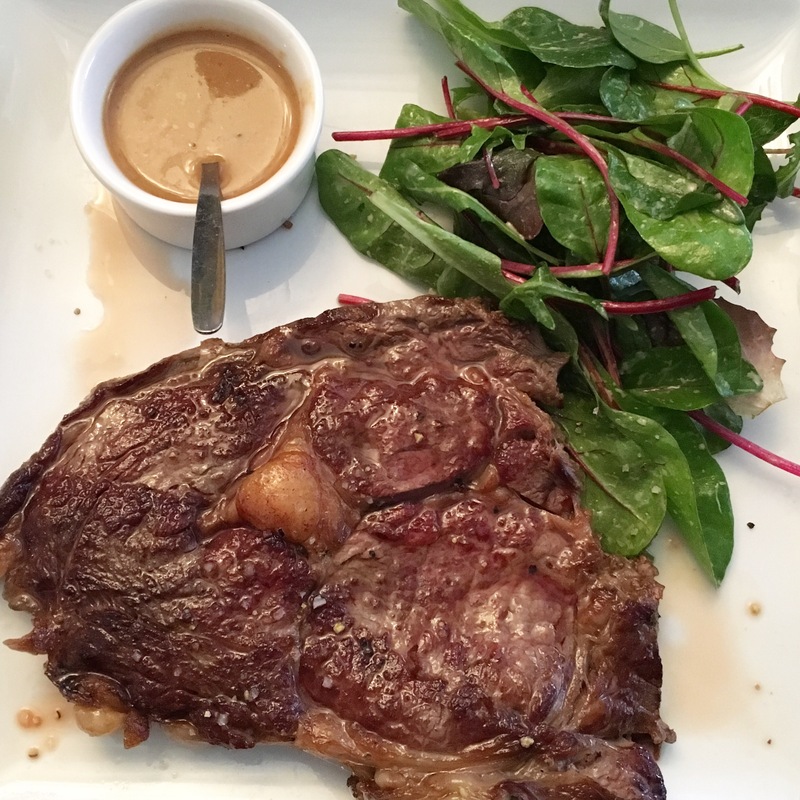 Our meal was so perfectly French, and I washed my steak down with a beautiful glass of Cotes du Rhone, as I did with so many of my meals in Paris and it was a lovely last dinner to have before bidding farewell to this fabulous city. So there you go – a snapshot of our trip away. There was so much more that we did, and so much more that we wanted to do and didn’t get done. What better excuse to have to go back another time though. We had such an incredible weekend and I can completely understand why people fall in love with Paris when they visit, it’s an intoxicating city in the best possible way and I’m already looking forward to planning another trip. Happy Saturday guys, I hope you’re all having a lovely weekend so far, despite the miserable weather we’re having in Dublin. If you’re further afield, I hope your weather is better than it is here! 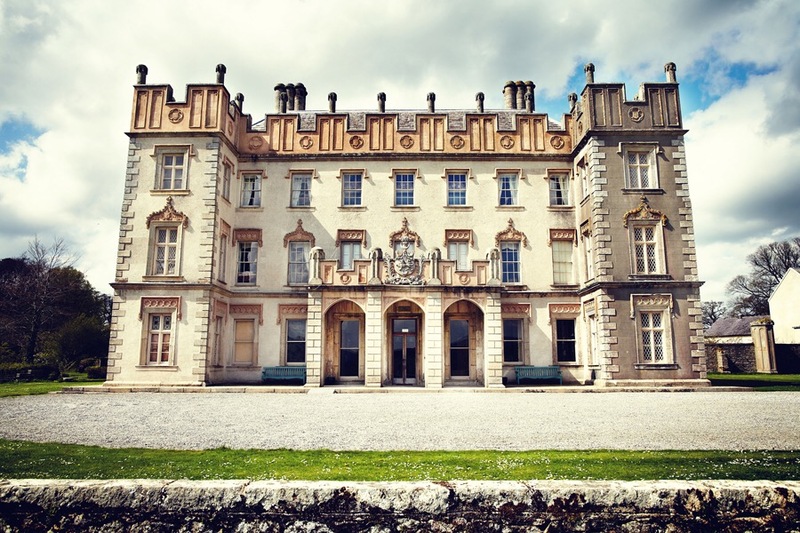 So this morning we are off to my good friends Julie and Jeff’s wedding in the stunning Borris House in Carlow. I’ve heard so many things about this venue, and as you can see from the picture it looks absolutely gorgeous so we’re very excited to get there and celebrate with our lovely friends. This is our third wedding of the year so far so there’s a lot of love in the air at the moment and it’s amazing. If you’ve been following my blog up to now, you’ll know that I’m a bit of a hopeless romantic and I absolutely love a good wedding. Knowing my friend Julie this is going to be a very special day with lots of amazing things going on so keep an eye on my social media to have a look at it all. My Instagram is: http://www.instagram.com/simplysorcha and my Snapchat username is: imsimplysorcha. I’ll be sharing a full post next week on our weekend too. Clearly the hair isn’t finished yet but I’ll take it down just before we arrive so that the curls are nice and bouncy. As I’m wearing a black dress I’ve also gone for a charcoal smokey eye. We’re on the road now so I’ll sign off for the weekend, hope you all have a great one. 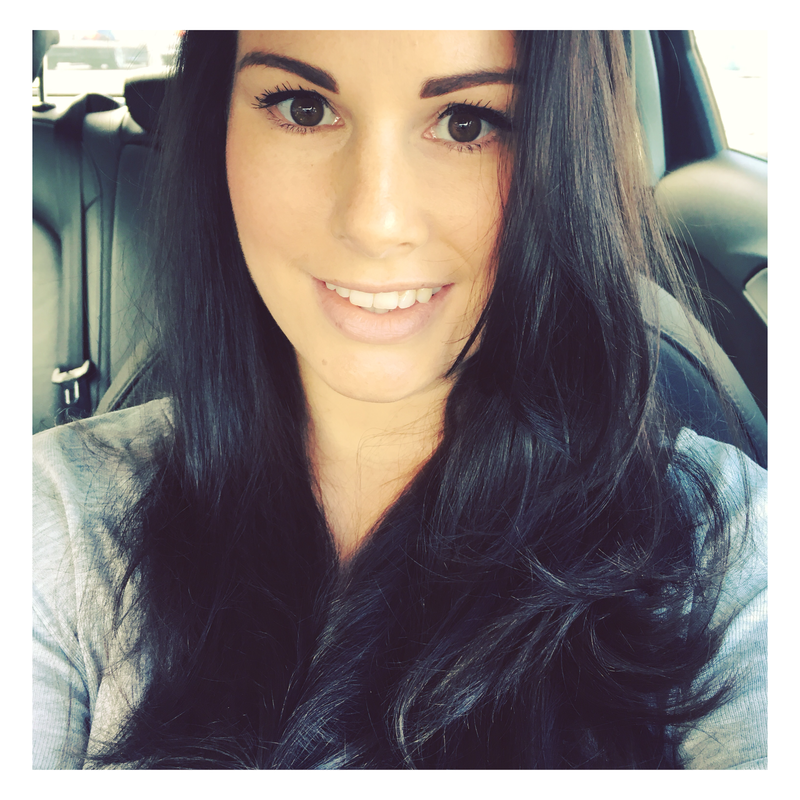 It’s been a few weeks since I’ve shared my Fridaygram with you, things have been hectic with my day job and blogging has unfortunately taken a little bit of a back seat. But as I said earlier this week, I’m back in the swing of things now and promise to keep the blog posts coming. While things have been busy in work, they’ve also been busy socially too. I had a friend’s wedding, a trip away, a flu, and lots of other bits and pieces going on. As always however, I’ve been snapping away and sharing lots of pictures over on my Instagram, so I’ve put a selection of them together for today’s Fridaygram post. 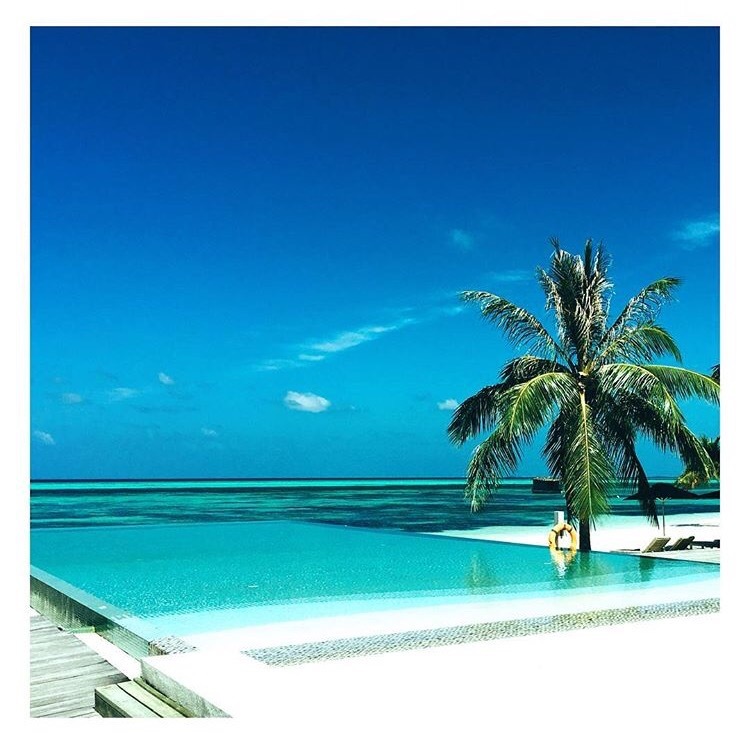 In December we went to the Maldives on our honeymoon and it was the most incredible holiday I’ve ever been on. The weather has been pretty miserable this March so throwback photos to holidays keep me going! I got a hair chop, there’s nothing like a bit of me time in the hairdressers so I try to go as often as possible. I love the soft curl my new layers give my hair, though it never looks as good when I blow dry it! I absolutely love Essie nail polishes, they are my favourite of all the brands as they don’t chip too quickly on my nails. Going to get my nails done is one of my absolute favourite things to do and picking my polish colour is always the most fun part. 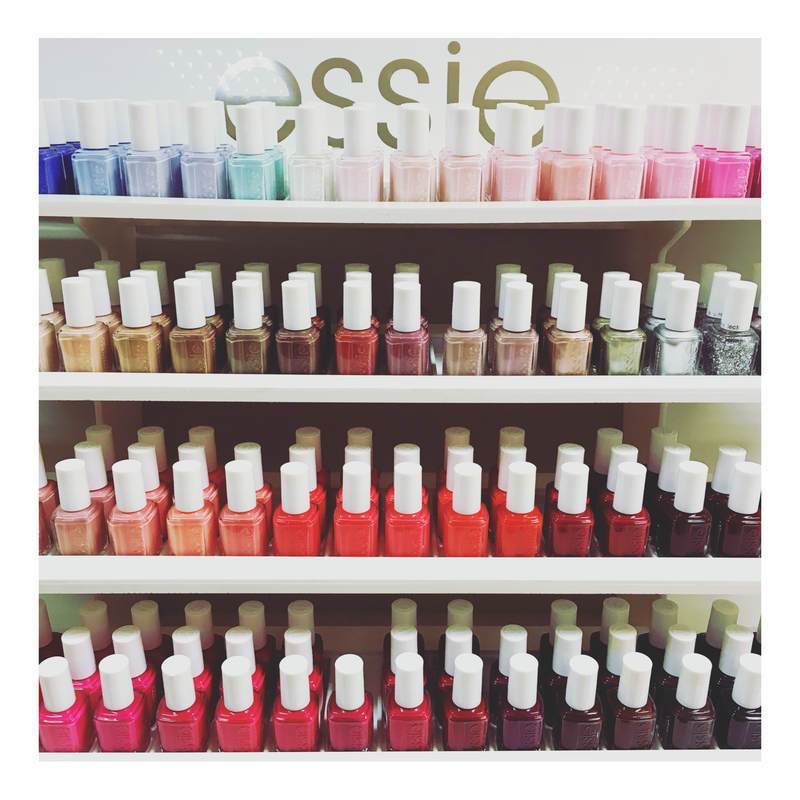 So much choice, so few nails! I also spotted these beauties when I was out shopping a few weeks ago, sadly I didn’t purchase but they’ve been added to my wish list. 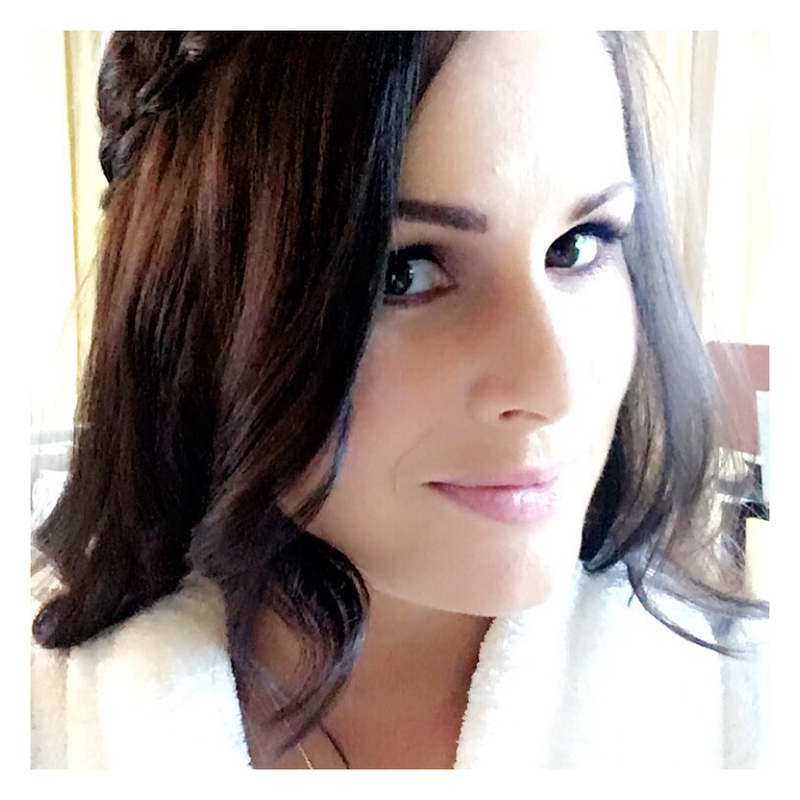 This was the weekend of my friend Nikki’s wedding in Sheen Falls Lodge in Kerry. 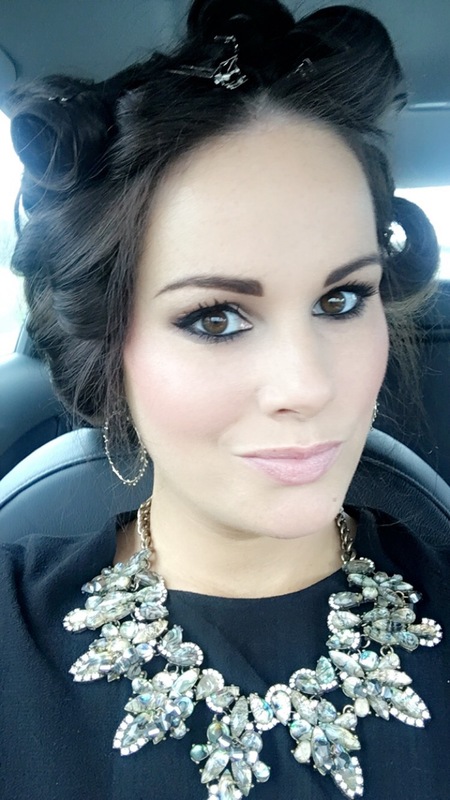 On the Sunday I shared a snap of my hair and makeup look for the wedding from the lovely Dearbhla Keenan and Roy Leigh in Brown Sugar. What a great weekend it was. 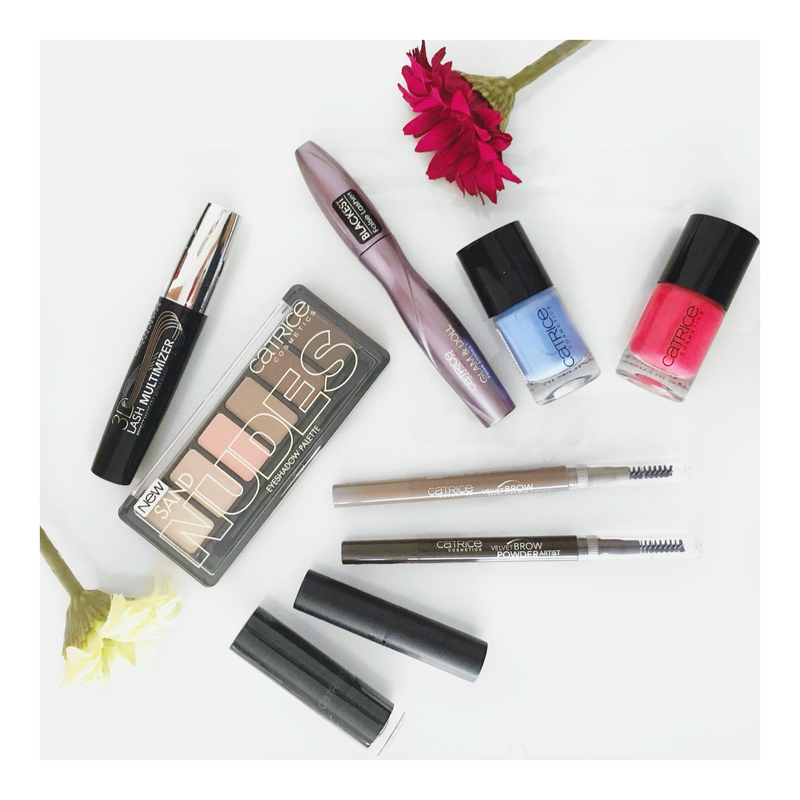 The lovely people over at Catrice Cosmetics sent me some of their SS16 makeup collection to try out. I’m currently testing them out and will be sharing a blog post on my favourite bits from the collection shortly so if you’re a fan of Catrice then watch this space. As I mentioned earlier, I had an awful flu last week so I tried to eat as much berries and healthy foods as possible to detox and boost my immune system. 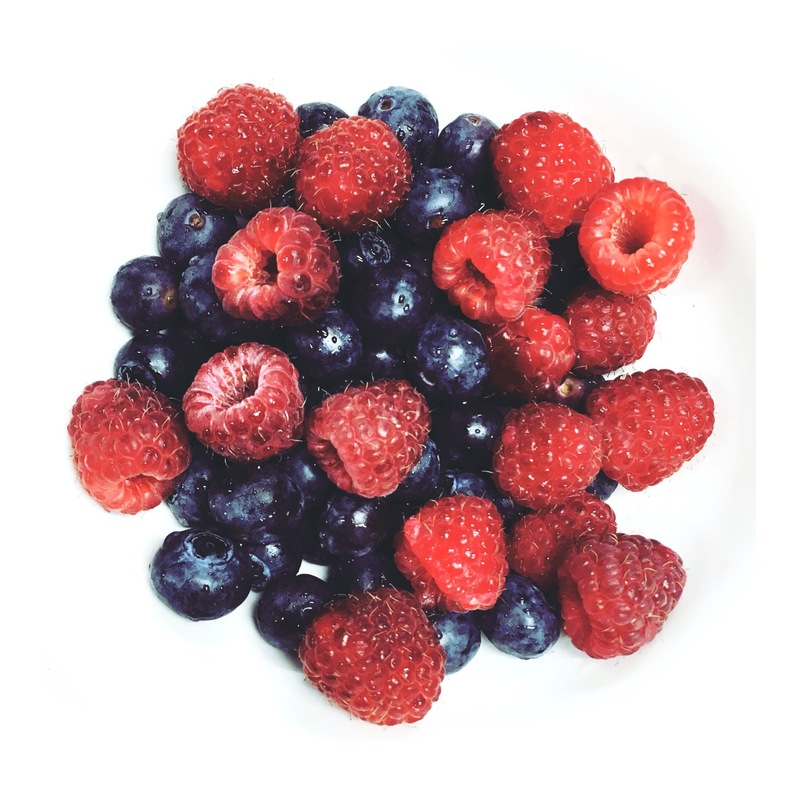 Also, because I just love berries, especially coming into summer. The day we jetted off to Paris, yay! 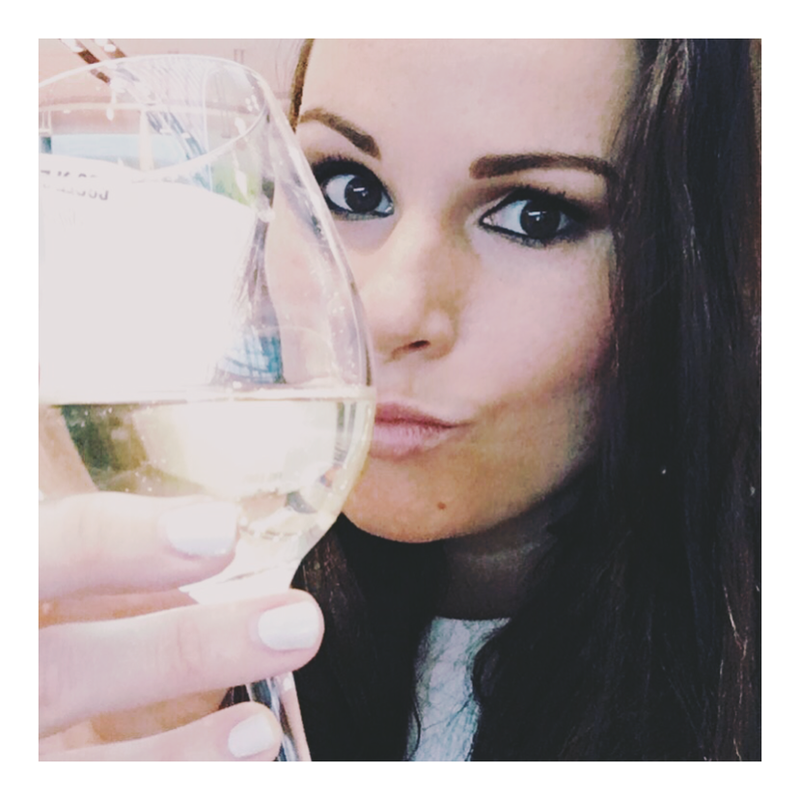 No weekend break away would be complete without an airport selfie so of course I just had to share one with my glass of vino. I’ve wanted to go to the Love Lock bridge in Paris for so many years, and I finally got there last weekend. I’ll be sharing a full Paris post on the blog next week with a run down on what we did so you can read all about it then. 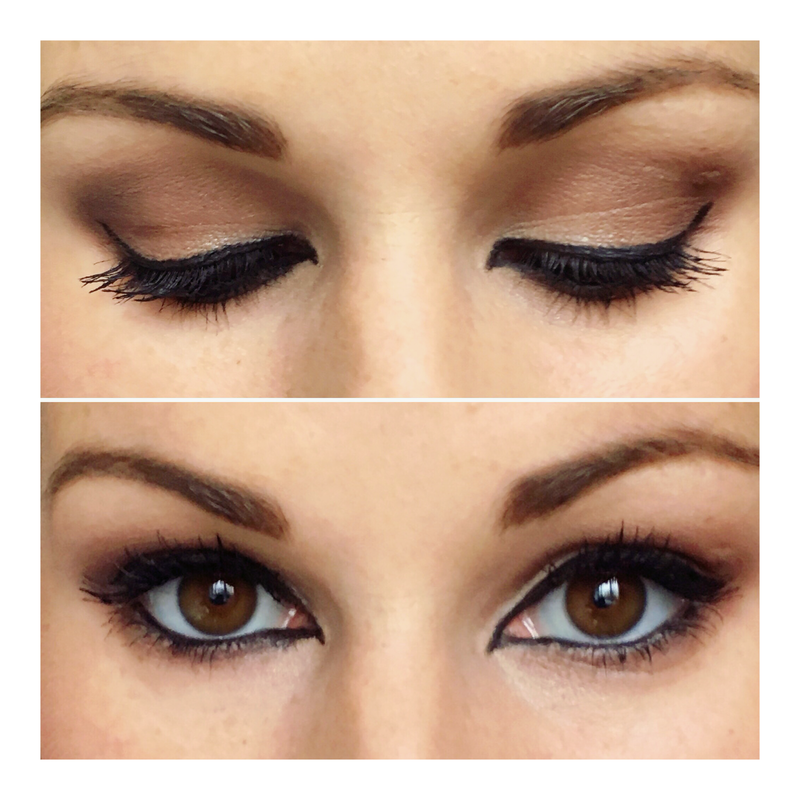 If you read my review on the Urban Decay Gwen Stefani eyeshadow palette you’ll have seen this pic already, but this is the makeup look I created using my favourite shade from the palette, Punk. It’s a horrible morning in Dublin, it’s raining, it’s grey, it’s depressing. 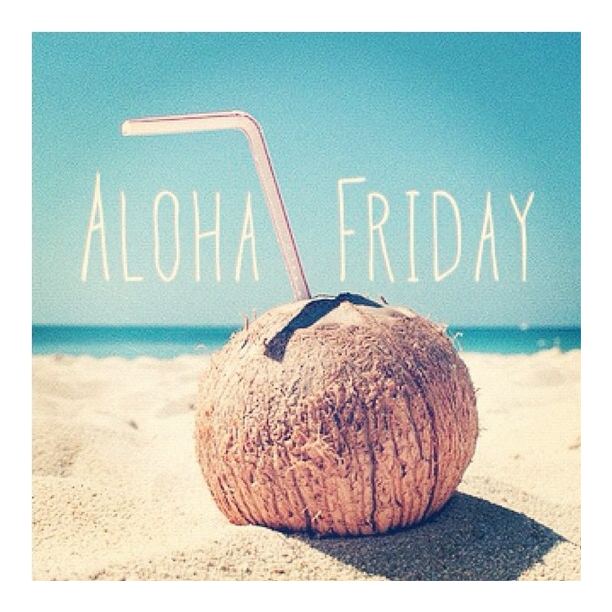 So today I shared this Aloha Friday picture, to cheer myself up and imagine I’m somewhere sunny sipping on a cocktail. So there you go. I’ll be back to posting this regularly every Friday from next week. Don’t forget, if you’re not already following me on Instagram, then please come say hi and follow what I’m up to over there.